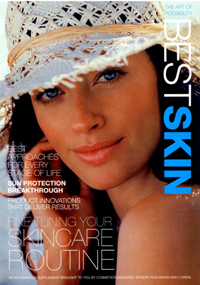 “Instead of looking for the ‘new best thing’ on the skincare shelf, people should have a proper skin assessment and stick to what works best for their skin,” says Dr. Lisa Kellett, a Toronto-based dermatologist. “Think of it as the equivalent of low-rise jeans. They might be fashionable but they don’t fit everyone’s body type, so why wear them if they don’t work for you?” She also advises giving a new skincare regime two months to show results. It takes time for the skin to get used to a new formula and for the benefits to become obvious. “Skincare doesn’t have to be complicated,” she continues. Just start with three key items and work from there. Following a skin assessment, choose a cleanser that is appropriate for your skin type. In your early 20s, it is likely you’ll have oilier skin, so buy a product that is formulated to control excess oil. This should be the first product you buy. A sunscreen will protect against future sun damage and thus slow the effects of aging. You’ll find a new range of formulas that are much more comfortable to wear, from light fluids to gels and sprays. Wait 20 minutes after cleansing to apply a moisturizer. This gives the skin enough time to allow its natural oils to come to the surface. You may find you don’t need a moisturizer. If your skin still feels tight, apply a light oil-free, gel-based formula for comfort. Your skin is at its peak condition in your early 20s. Cell turnover is a quick 14 to 25 days, and elastin and collagen production is optimal. Most men and women tend to have oilier skin conditions, which helps plump up skin preventing fine lines and wrinkles from appearing. The key at this stage of life is to find a broad-spectrum sunscreen that you like and feels comfortable. Sun damage accounts for 80 percent of the factors we call aging: wrinkles, brown spots, leathery texture, sagging. And while much of the damage is done during our childhood, preventing additional damage will slow the effects appearing. By wearing sunscreen every day, you’ll look younger, healthier, longer.